American Federation of Astrologers, 9780866905206, 128pp. 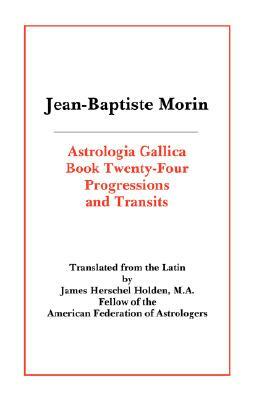 This book is an English translation of Book 24 of the Astrologia Gallica, in which Morin explains the proper use of Transits to pinpoint the time when a predicted event will occur. He first criticizes the various types of symbolic directions used by other astrologers of his day and then sets forth his own method of prediction with numerous examples. The nature and time of an event in a person's life can be determined from his Natal Horoscope, its Primary Directions, Solar and Lunar Returns and their Primary Directions, and concordant Transits. By following the method that he sets forth, it is sometimes possible to determine the exact Day when the event signified by a radical Primary Direction will occur. Morin was a physician who became the most renowned of all French astrologers. He was appointed Royal Mathematician to King Louis XIII and was summoned to be present at the birth of the royal heir, the future King Louis XIV. The present volume also contains example charts drawn for the actual times of significant events in the lives of a number of 17th century celebrities; each chart is accompanied by a explanation of how the several factors combined to produce the events at the times shown. The book closes with two chapters setting forth general instructions for determining the precise time of events and a final chapter with valuable rules for reading natal horoscopes. James Herschel Holden is Research Director of the American Federation of Astrologers.